We are considering today the concept of a Christian worldview in regard to a holistic understanding of the life of the “Kingdom of God.” This kingdom program of God, finding it’s full revelation in Jesus Christ, involves many aspects including grace, the problem of evil, the nature of redemption, and how humanity ought to live out the new life in Christ. In the fullness of this theological understanding of the kingdom of God we find what it means to view the world from a truly Christian perspective. Secondarily we will also address the topic of ministry, and what sort of core theology would best define the true daily practice of the Christian faith as a saint of the church. We’ll start right at the beginning, which leads us to the program of sin and evil. We can only properly understand the life of the kingdom when we first consider our origins. The God of the Bible created the world in six days, and rested on the 7th. Everything we see therefore is created by God, or constructed by God’s creations. The observable universe is a brief and limited description of the incredible depth of character, glory, power, and ability within the character of the Author of Life, Jesus Christ who is God. Nature is a picture of the beauty of God. God created the universe, all the galaxies, time, space, reality, and our Earth. On Earth, with great care and love God built the first humans Adam and Eve. God gave the greatest gift imaginable when he gave free will, the ability to choose right or choose wrong. The first humans existed in a state of spiritual and physical perfection, in the direct presence of their Father, God, who had made a garden on the surface of the Earth for their dwelling and relationship. So now we consider the origin of evil and sin. God made humanity, but he had other creations as well. In addition to the first humans developed by God, there were also spiritual beings called angels, which God had given the gift of free will. And they freely served their heavenly Father as well. One of these angels was named Lucifer (Isaiah 14:12). This spiritual being corrupted by his own desire for power came into the garden and suggested to the first humans that they ought to be their own gods, accountable to no one and so the first humans sinned and fell under the dominion of Lucifer, also known as Satan the evil one. At this moment of prideful disobedience humanity turned on their God to pursue their own way. God might've destroyed the first humans and been done with humanity at that moment, but that would’ve been contrary to God’s own gracious, merciful nature. So God the creator established a temporary scenario in which life and death would hang in the balance. God set up a final chance for humanity, allowing the sin their hearts conceived of to spread throughout the garden, across the Earth and the universe itself. At that moment the perfect universe became a crippled tangent universe destined for destruction. That is why the universe is so barren, why stars burn out, why seasons shift between fall, winter, spring and summer; All creation was affected by the curse of sin. Death entered the human race. And the natural inclination to sin, to plot a course outside of the sovereign God of the universe, became the natural state of all humans born into the line of Adam and Eve. Adam and Eve had ceded control of the human race from God to Satan, and Satan began to establish his own perverted kingdom on the fallen Earth. God continued to interact with humanity, and pursue humanity, establishing the nation of Israel through the line of Abraham, as the descendants of Adam and Eve multiplied. God gave Israel his laws. Yet Israel was unable to follow the laws. Israel struggled through captivity in Egypt, and struggled again in their wandering in the wilderness. Israel went through many wars, struggles, spiritual revivals, and spiritual downfalls, eventually splintered, and broken, and taken into exile by the Babylonian empire. God had spoken through prophets, priests, judges and kings. But all had come to failure, and Israel had become a broken nation, occupied by the Roman Empire. It was at this time in history when Jesus Christ, the God-man come to Earth was born into human history. God had decided that He would give himself, Immanuel, as an offering to allow his lost people to be rejoined to him as family, justified by faith. 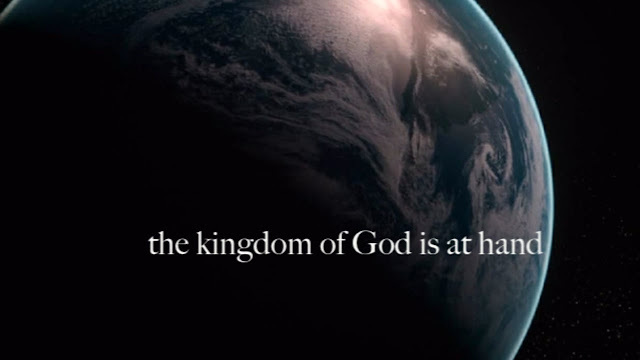 The coming of Christ into the world began the kingdom program of God. Jesus at the age of 30 began declaring the coming of the kingdom of heaven. He said that this mystery was that the kingdom of heaven was within each Christian (Luke 17:21). The nature of the kingdom of God is found in the perfect life, death, and resurrection of Jesus Christ. Jesus fulfills the Old Testament law of Moses, and suffers and dies on the cross as a substitutionary death, stepping in for each of us, dying in our place. Because each sinner deserves death. But Christ steps in and offers to die in our place. The kingdom of God program is Jesus’ declaration of this victory, and the fulfillment of it, when one becomes born again, and receives forgiveness of their sins and the gift of the Holy Spirit (Acts 2:38). Saving grace is the concept that we are saved by faith alone in Jesus Christ. It is pure grace because there is nothing in us that can take away sin, only Jesus can remove it. And the only thing we can do in response to this free gift is to believe in Jesus Christ to receive it. We trust Christ as our savior, as our living savior, and so we receive the saving grace He offers. But truly our entire lives are testaments to the grace of God. But this is a different kind of grace. It is the grace that goes before us, what theologians call “prevenient grace.” Prevenient grace is the grace that God offers us as he begins to reveal himself to us in our lives. Prevenient grace is the presence of God pursuing us in our lives, and revealing Jesus Christ to us slowly over time. Prevenient grace makes the offer of salvation to us, and it is offered to all people on the Earth. So as born again, Spirit filled followers of Jesus we live by faith. We live by trust and full reliance on Christ as savior, comforter, and friend. He is our prophet, priest, and king. But this is not an incoherent faith. Faith is not blind, but highly reasonable and coherent. We believe in the radical notion of reasonable faith in God, the God of the Bible revealed in the makeup of the universe, of Earth, in geology, in astronomy and all the sciences, as well as empirically, historically, and philosophically. God’s existence, attributes, and divine work are clearly demonstrated in the natural world (Romans 1:20). There is evidence everywhere that God exists and made the universe (Psalm 19:1-6). The evidence points to the fact that an intelligent designer is required given the fine tuning of the observable universe, as well as the complex architecture of the human body, and the need for a prime mover outside of space and time. We believe that the Bible is the full and complete revelation of God to the whole of humanity. The Bible, being the most extraordinary document in human history, contains the records of the origin of humanity, the foundation and life of the nation of Israel, to the birth of Jesus Christ, the life of Christ, the cross of Christ, the acts of the early church, the letters to the early churches, and the revelation depicting the end of the tangent universe and the birth of the new heavens and new earth. The Bible describes in perfect form the past history of humanity and the prophesied future of humanity. Jesus Christ was God come to Earth, yet he lived the life of a humble servant, obedient to the heavenly Father. He was obedient and humble even to death on the cross, for the sins of humanity. The death, burial, and resurrection of Jesus Christ is a historical fact. The work of Jesus Christ on the cross blotted out the sins of all who would put their faith in Him and repent of their sins, choosing consciously to follow him. The work is complete and the victory of Christ pays for all sins of the believer, past, present and future. The only way to lose this gift is to consciously choose to withdraw faith in Jesus Christ. Shipwrecked faith and falling away is too consistently mentioned in the scriptures to ignore. The current ministry of Jesus Christ is in heaven where he literally lives, alive and well since his resurrection and ascension where He intercedes for humanity to the father and ministers across the Earth through the Holy Spirit. Jesus Christ sent the Holy Spirit the third revealing of God who currently, today, works among the nations of the planet to do the will of God, whom he is. So if this is our theological core, if this is our profile of the full revelation of the scriptures the question becomes: How do we live this out? How do we conduct ministry in a biblical manner? We believe in discipleship, missionary work, and consider the task of making disciples of all nations to be the primary imperative of the church of God on Earth. The primary imperative that flows out from the revelation of the kingdom of God, the gospel, is the great commission to make disciples of all nations (Matthew 28:19). First of all we approach preaching the gospel. To me this is the primary imperative of the scriptures, and the meeting of needs is a close secondary. As our primary imperative of preaching the gospel we see it broken down into three key areas: Worship, evangelism, and discipleship. The early church in the book of Acts consistently met together to study the scriptures and worship and celebrate the risen Christ. Worship is a key practice of the church and as much must be central in any theology of ministry. Second we consider evangelism. What good is it to gather together and worship Christ if there are none desiring to worship? Evangelism is about going out into the community, knocking on doors, speaking to people on the street corners, and being present at community events. Evangelism will become increasingly important as western civilization continues to jettison it’s Christian origins and framework. People no longer see the church as a viable place to go when searching out the deep questions. We’re going to have to get increasingly comfortable with going out to meet them, which is simply a re-institution of the origins of the Salvation Army as a street movement. Thirdly we consider discipleship. Does the great commission say that we must make converts of all peoples? No. It says that we are to make “disciples” of all nations. What use is it to gather to worship on Sunday, evangelize during the week, only to live out a milque-toast Christianity that has no depth of transformation? There is no use in it. This is why deep, meaningful discipleship is necessary to the practice of the church. We must gather together, not simply for Bible study, or for worship, but we must meet together as small groups, to “be real” about our faith walks, to share our struggles, and to challenge one another to grow in holiness. We must have meaningful discussion on a weekly basis in regard to true Christian growth, searching the scriptures diligently for the depths of Christian spiritual disciplines and true Christian worldview. This will help produce converts who are deeply in love with the risen Christ and able to live out their faith in the muddiness of the real world. All three of these sub-sections are necessary to the proper practice of Christian ministry. Without even one, the church fails and dies. With all three, the church is able to grow and live out an empowered, real, fruitful Christian ministry. Next we consider the important secondary concern of “meeting needs in Christ name without discrimination.” To me I see three areas of ministry that are essential to the practice of meeting needs. These three areas are: social services, compassion ministries, and social justice. Social services is a wide umbrella term, but in the way we’re using the term we’re thinking of it along the lines of feeding programs (food distribution), helping people pay bills, pathway of hope (a program of case working to help families escape poverty), and sheltering the homeless. These programs are necessary in that Christ specifically commanded his followers in Matthew 25:31-46 to feed the hungry, give water to those who are thirsty, visit the sick, visit the prisoner, and shelter the homeless. In the parable in Matthew 25, Christ consigns those believers who did not practice these ministries to the lake of fire. That seems quite clear to me, that these ministries are necessary. Compassion ministries are also essential to this formula of meeting needs. We should be regularly visiting the elderly in nursing homes, engaging in jail/prison ministry to inmates, providing rehabilitation services to those who suffer in alcohol and drug addiction, visiting hospitals, and other ministries of compassion to those in need. Thirdly, we consider the ministry of social justice. What use is it to provide food, housing, rehabilitation, and so on, if we are not advocating for changes in our society that would help hasten the end of these terrible ills of our age. Christ has called us to help guide and preserve society across the entire world. We must advocate for changes in society, we must advocate for the end of abortion, we must advocate against human trafficking, we must advocate against the radical redefinition of marriage, we must advocate against racism, against inequality, and advocate for those who are suffering in our society. All three of these areas of meeting needs are necessary, without which each of the others become ineffective. So in conclusion, to do ministry effectively we must understand the core theology of the Bible. This core is built upon the foundation of the scriptures which outline a holistic Christian worldview. This Christian worldview is best lived out through the practice of the kingdom program of God preached and lived by Jesus Christ. To live out this kingdom program of Christ we must preach the gospel, and meet human needs, which is best lived out through six subsets of ministry work: Worship, evangelism, discipleship, social services, compassion ministry, and social justice advocacy. What is the Meaning of the Fall of Man?